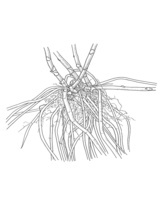 Description: Vine with wiry climbing perennial stems to c. 5 m long; spines recurved, usually < 5 mm long; final branches and cladodes in one plane; with central crown, roots fibrous and some fleshy (no distinct tubers). Leaves scale-like. 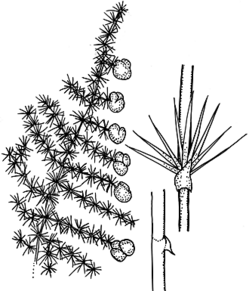 Cladodes 8–15 in each axil, terete, 4–7 mm long, c. 0.5 mm wide, ± glabrous. 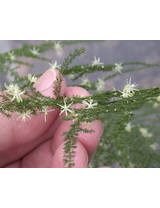 Flowers single or paired, terminal on lateral branches; pedicels 1–2.5 mm long, jointed near base; tepals 3–4 mm long, greenish to white. Berry ± depressed-globose, 4–5 mm diam., black at maturity; seed 1. Distribution and occurrence: Cultivated as an ornamental; extensively naturalised in coastal districts north from Royal N.P. and on LHI, occasionally naturalised inland. 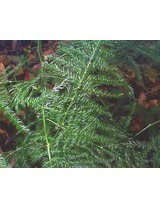 It is often a serious weed in bushland because once established it is difficult to eradicate. 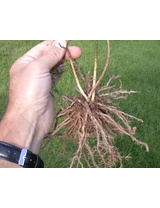 A declared noxious weed on LHI. Native of southern and eastern Africa. 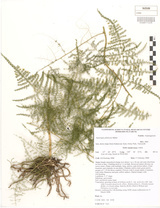 Plants in Australia have also been called A. setaceus but that is a separate African species that is not known to occur in Australia.